﻿Hardly a wisp of wind blows across the deck, the midday sun is warm, activity in the marina is sultry and slow, a mood of disconsolate acceptance hangs in the still air. The benign weather, nice as it is, unfortunately represents another missed weather window. As the calm centre of a high pressure passes over us, its back edge will bring northly winds closing any opportunity to sail north. As predicted the disturbed systems hanging over the tropics have produced bad weather over the islands. The tropical storm spotted last week, has deepened to produce a cyclone. Cyclone Donna is a rare out of season, destructive, category three cyclone and is currently bashing Vanuatu. It’s future path appears unpredictable, the risks of leaving New Zealand on Friday were too high, so with the rest of the cruising fleet, we wait. ﻿Everywhere jobs that have languished way down at the bottom of ‘to do lists’ written years ago, are seeing the light of day, cars are being hired for day trips and many boats have sailed into the bay to pass the time. 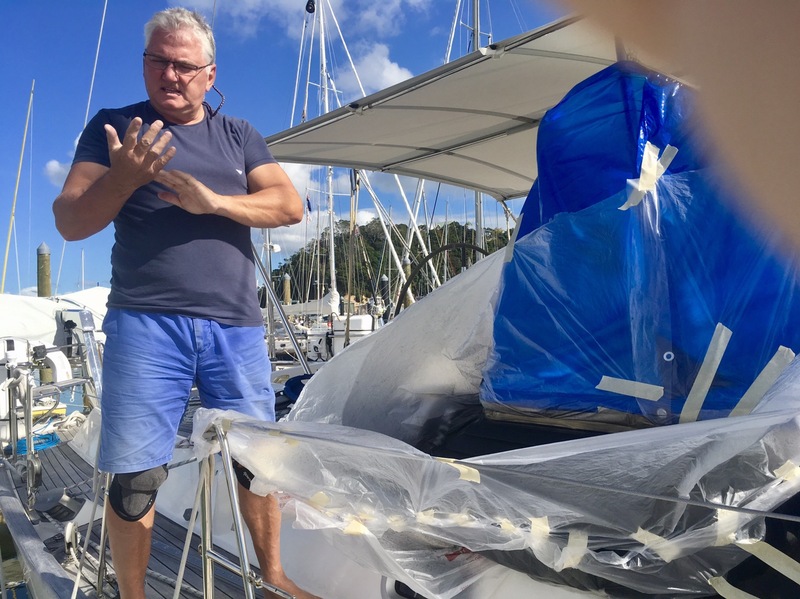 Yachts that left for Fiji early last week are being nervously watched by tracker, SSB radio and any other means, they report back high winds and rough seas but luckily all lie east of Donna and are OK for now. The obsessive weather map watching has stopped, departure with the arrival of the next high, due at the end of the week looks uncertain and rest on the shoulders of Donna, everybody is settling in to be here a while longer. Not that that is too awful a prospect, the nights have been chilly but the days sunny and pleasant. Today Rick is taking advantage of the calm to paint the black side vents, a job that has been hanging over us since being put aside as we rushed to leave Southampton. I’m not sure Raya has ever been so polished. The previous two days however, feeling a little let down by more delays, we deserted our cleaning posts and decided to get out and about. Friday we went for a walk on the local beach, encouraged by the sturdy boardwalks we walked on around the wooded coastline. The boardwalk stopped but it was a pleasant and varied track, over tree covered cliffs, mangroves and across rocky beaches, we were enjoying ourselves and we walked on. 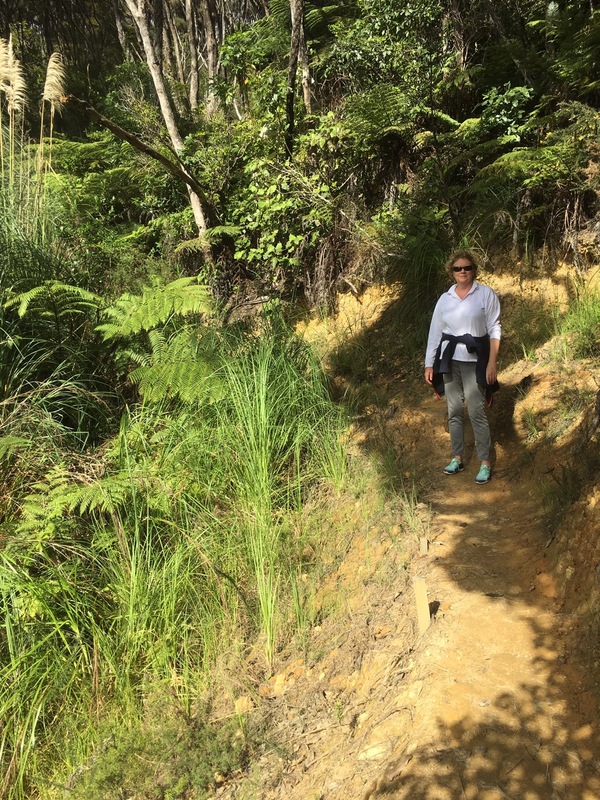 An hour and half later after a particularly steep section, we keenly wanted the end of the track, the town of Paihia, lunch and a taxi home, to be just around the next headland. Not a chance. There is something about us and walking, normally so organised and well prepared in life, we seem to set out for strolls that turn into hikes. We only had second hand directions of what lay ahead, we didn’t even have a bottle of water, we had on too many layers of clothes for the conditions and my footware was woefully inadequate. Another hour on and we made it across the beach, the last part of the walk, just before the incoming tide cut us off, half an hour later and we would have been forced to retrace our steps – all the way back. Saturday with still sore feet we hired a car and drove north. The car from Rent-a-Dent was mostly dent free but small and uncomfortable, we abandoned plans for the three hour drive to the very northern tip of New Zealand and the dramatic cliffs at Cape Regina and instead stopped about halfway to check out Doutless Bay and the Karikari Peninsular. Here the scenery is very different to what we’ve been use to, flat by New Zealand standards, with wide open white sand bays and the start of the huge sand dunes that stretch up the most northern of New Zealand’s beaches. Dominating the landscape was Pampas grass, an invasive species introduced from South America, it seemed to be growing everywhere, even amongst the woodland and tree ferns. 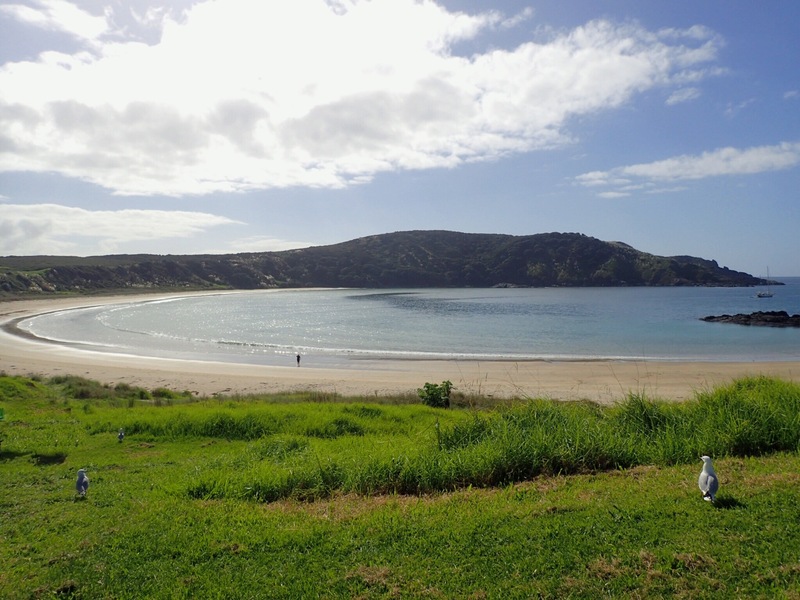 We drove to Maitai beach at the very end of the peninsular and strolled its large curved shore and then stopped in the seaside town of Manganui to eat fish and chips on the harbour front. Back on the boat I steal a glance at the weather forecast. If the remanents of Donna do dip south enough to hit New Zealand, we will have, yet again, stormy wet weather, this may disrupt the next high pressure ﻿﻿system, produce very rough seas and wipe out yet another weather window, I wonder how long we need to be here to become permanent residents! This entry was posted in Getting Ready, New Zealand by Roz. Bookmark the permalink. Hope we get to see some lovely pics of the now gleaming and fully working Raya before you mess her up with a trip north! Not sure a photo would do it justice, but we know those pesky nooks and crannies are dirt free, as you say for today at least!